I think everyone will agree that a day which includes chocolate is a better day (I should know- most of my days do). I’m not a snob when it comes to chocolate, although I do prefer the darker varieties, especially the ones with sea salt (damn, even thinking about it, my day gets better). I’m even less of a snob when it comes to cooking with it: I often go classic and just add it in cakes and cookies, I’ve dunked fruit in there, I’ve mixed it with nuts and spread it on brioches and croissants. There’s also a pretty cool beef stew I like to make, with just a touch of cocoa in the sauce, which always makes me want to eat meat more often. 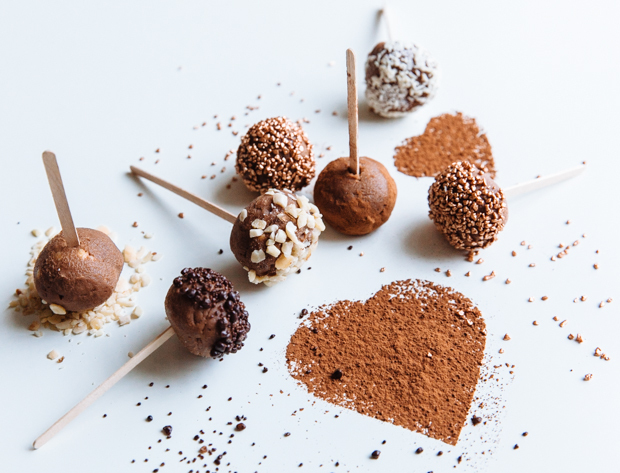 These little chocolate balls combine three of my favourite ingredients: chocolate+peanut butter+cream cheese=heaven, right? The last time I mixed these three together, was to frost a birthday cake for M. He claimed it was the highlight of his party- which I was very happy to hear, even though I’m pretty sure that the cake serving part of the night fell into the ‘Dude, what happened last night?’ category. So chocolate, peanut butter and cream cheese it is again: lots and lots of milk chocolate chips, a generous dose of salty peanut butter (I prefer crunchy, for texture, but smooth will also do) and finally some cream cheese for smoothness. Cream cheese is beaten until softer and smoother, chocolate is melted until silky and gorgeous; peanut butter is added to the chocolate (by which time your will power will be seriously tested, what with all that effort to not eat the entire thing and the hell with the recipe) and the two jump into a big bowl along with the cheese. Stir, stir, stir until everything is mixed, pour into a baking pan and refrigerate. After a few hours, the real fun starts: little scoops of this 3-ingredient miracle are formed into balls and dipped into absolutely anything and everything your heart desires: chopped nuts, chocolate coated popping candy, crunchy sparkling bits, white chocolate shavings, cocoa powder, powdered sugar- just everything. Happy V-day, everyone! 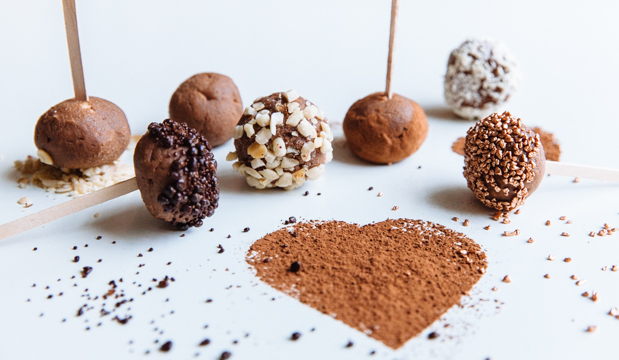 Share the chocolate, spread the love! Line a medium baking pan with parchment paper and set aside. Beat the cream cheese until smooth and set aside. 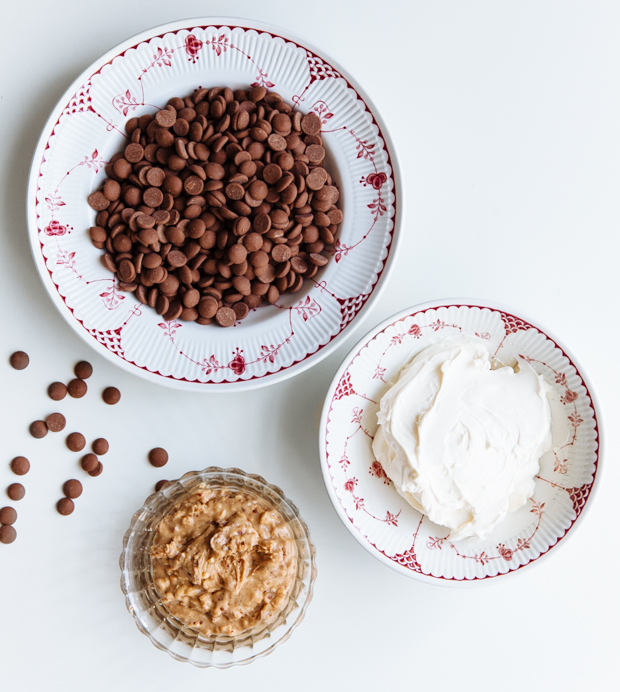 Put the chocolate chips in a medium bowl and place over a pot of simmering water. 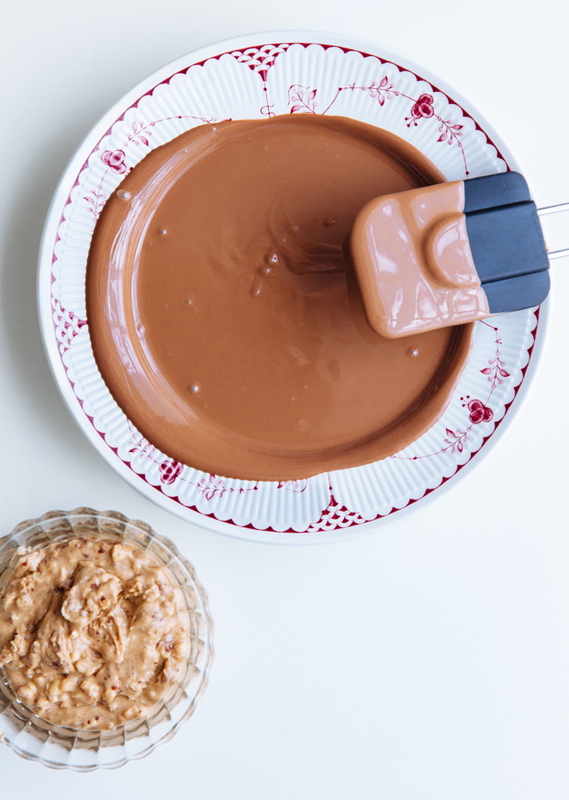 When the chocolate has melted, add in the peanut butter and fold until incorporated. Add to the beaten cream cheese and stir again until well mixed. Pour the mixture into the parchment paper-lined baking pan, cover with foil and place in the fridge for 5-6 hours or overnight. Take big scoops of the mixture and roll the into balls between your hands (if in the meantime the mixture softens, briefly put back in the fridge and then continue as before). 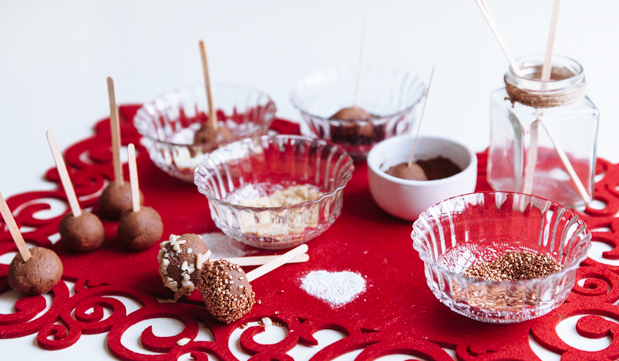 Insert a small wooden stick in each ball and dip into the different toppings.